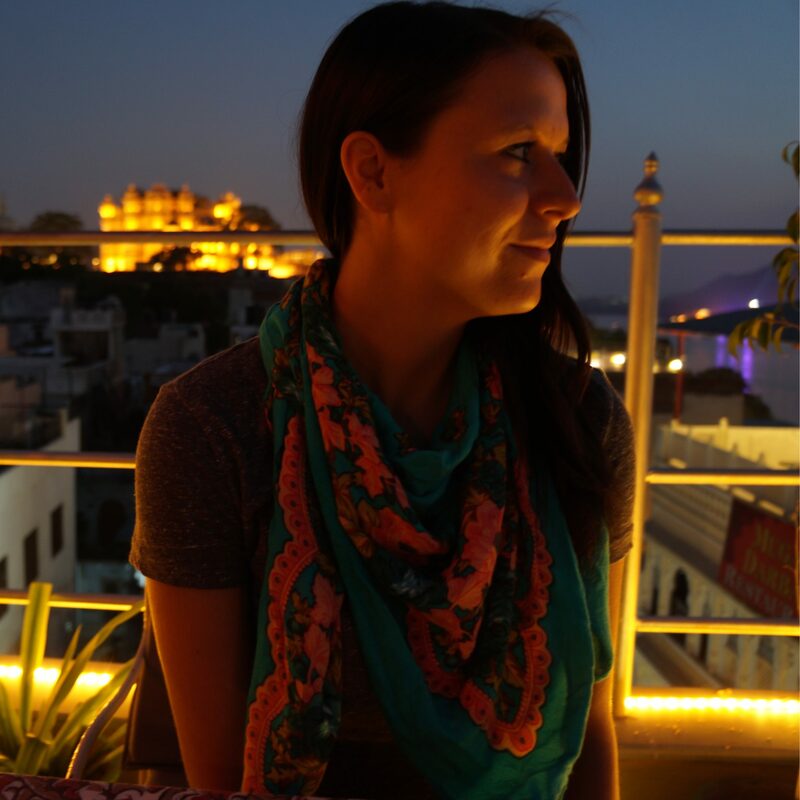 Before I moved to Edinburgh, I penned a list of the places I most wanted to visit in Scotland, and the Isle of Mull sat firmly near the top; its white sand beaches and wild, natural beauty beckoned. Mull may be overshadowed by its larger and more popular neighbour, Skye, but there are plenty of reasons to make a trip to this underrated island. 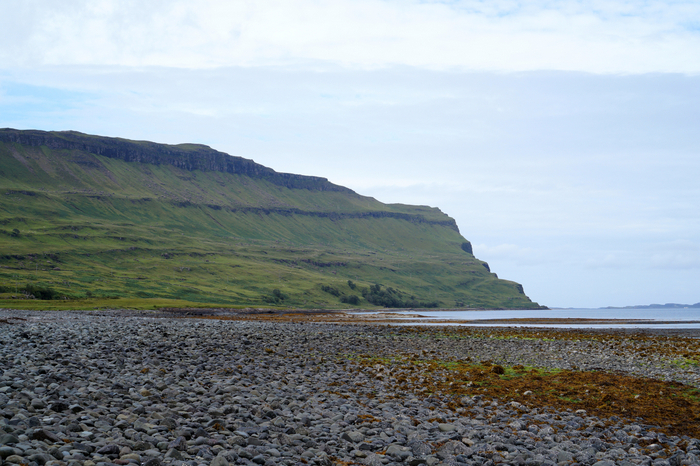 After circumnavigating almost the entirety of the island, I saw a fair amount of Mull’s varied coastline: the west side of the island is dominated by steep cliffs and rocky shore, while the east is softer with lush greenery. There are countless beaches and bays along the coast, and I couldn’t help but stop the car every few minutes to snap photos of the stunning scenery and sweeping sea views. 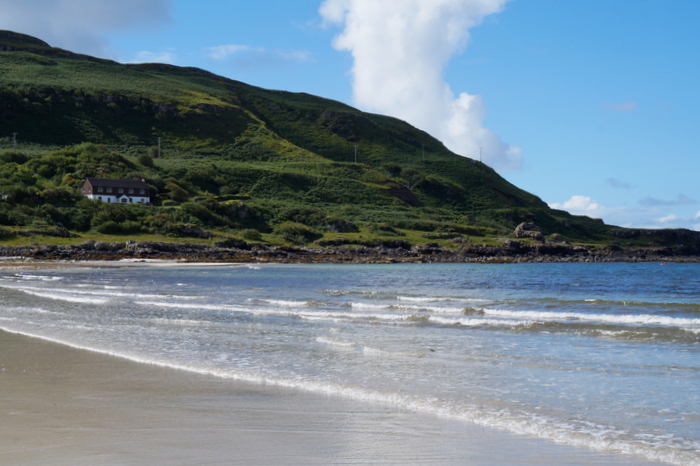 Most beaches on Mull have have white sand and crystal clear turquoise and emerald-toned seas, and that’s exactly what I saw at Calgary – one of the most popular beaches on the island. I use the term ‘popular’ loosely, as it still felt like we had the beach to ourselves on this particular day. Other beaches, like Langamull and Market Bay are secluded and slightly difficult to reach, so there’s a good chance you might actually have one of these beaches entirely to yourself. Between April and October, the waters surrounding Mull are a prime place to spot whales and dolphins, and boat tours depart from Tobermory. Minke Whales, Basking Sharks, and Bottlenose Dolphins are most commonly seen, along with the occasional Killer Whale or Humpback Whale. With a variety of eagles and various other bird species, bird watching is popular on the island, and puffins can be seen nesting on nearby Staffa. 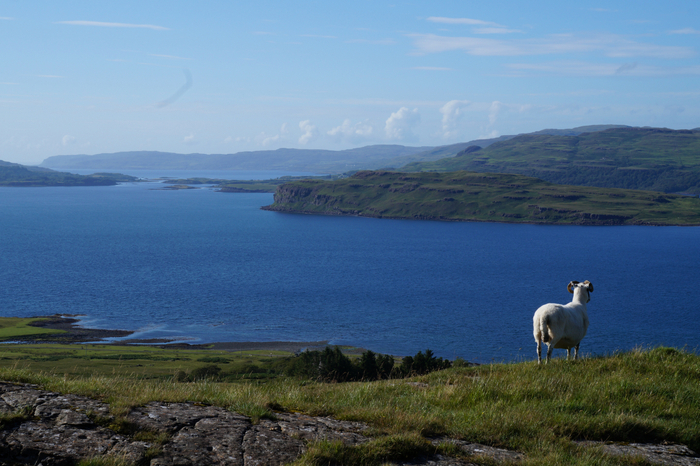 I ate so well on Mull; high-quality, locally sourced food abounds here, with specialties like freshly caught seafood, grass fed beef, and artisanal cheese. Most restaurants on Mull are concentrated in Tobermory, and I’d highly recommend Cafe Fish for phenomenal seafood dishes (be sure to make a reservation in advance). Their personal fishing boat delivers fresh shellfish at 4pm everyday, and all other ingredients – from fish to chicken and produce – are supplied by local companies on the island. The menu is chock-full of tasty offerings; I tried seafood linguini with mussels, clams, prawns, and some of the best scallops I’ve ever tasted. The fish pie – filled with salmon, haddock, and scallops – was also incredibly rich and delicious. The small, family-owned dairy farm aptly named Isle of Mull Cheese is definitely worth a visit; you can tour the farm and visit the underground cheese cellar, or have lunch in their adorable cafe (only from Monday to Friday – much to my dismay when we traipsed in on a Saturday). Traditionally made cheese is available for purchase in their shop, along with a variety of jam, chutney, and meats. Fisherman’s Pier Fish and Chip van is great for a quick and casual seafood meal at a fraction of the price of many of the restaurants in Tobermory. They have excellent fish and chips – the haddock I tried was tender and fresh, covered in a light and crispy batter. You may recognize the island’s colourful harbourfront town – it’s one of the most picturesque fishing villages in the country. With nothing more than a handful of restaurants, shops, and a whisky distillery on the main street, this placid town is the perfect spot to base yourself on Mull. It’s friendly and laid-back, and everything you need is within a short walking distance: Cafe Fish, the pub, and Tobermory Bakery. At 3,169 feet, Ben More is one of the highest Munros in the Inner Hebrides, and the only Munro on the island. I’m not going to lie, it’s no walk in the park – the ascent is a steep and grueling climb with rocky terrain – but the 360-degree panoramic view from the summit is spectacular (weather dependent, of course). 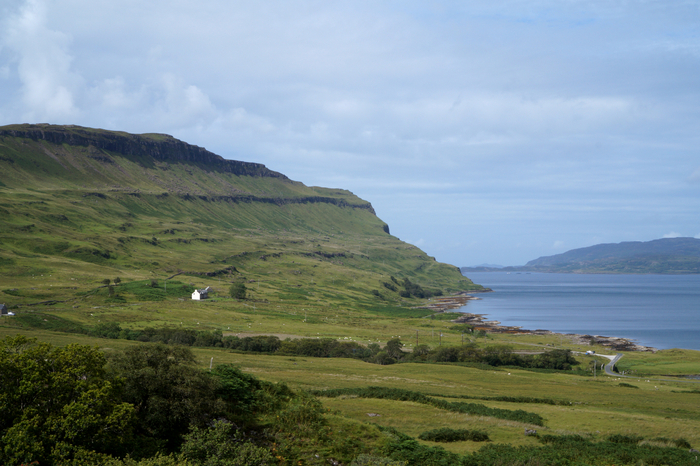 Mull’s remoteness and tranquility felt a world away from Edinburgh, but it’s actually quite easy to reach. Ferries to the island depart daily from Oban, which is located roughly two hours from Glasgow, and three hours from Edinburgh. 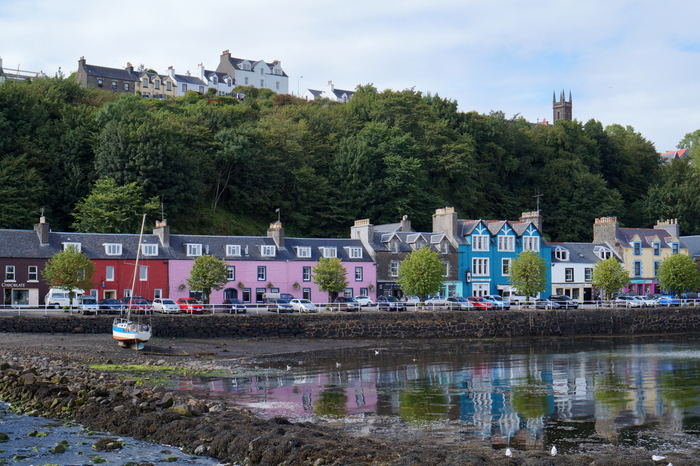 Once on Mull, it’s quick a 40-minute drive to Tobermory from the ferry terminal in Craignure. 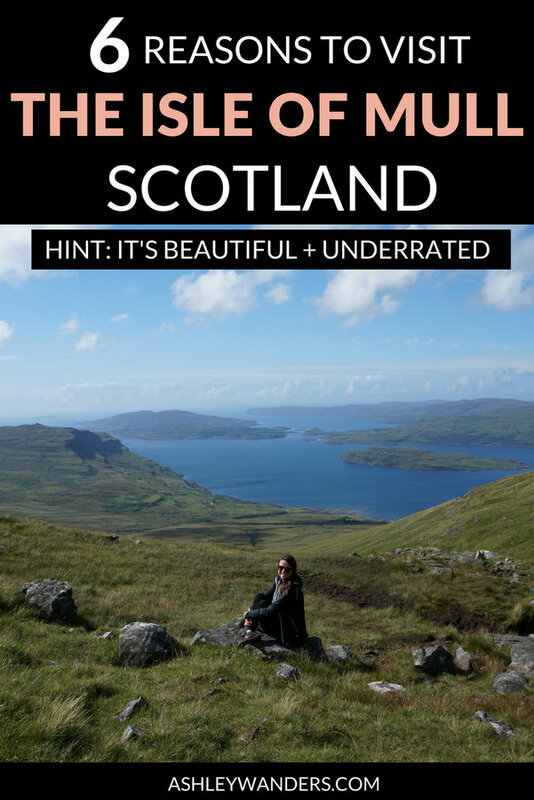 Have you been to the Isle of Mull? Is it on your Scotland wish list? It is a very peaceful place! This place looks incredible! 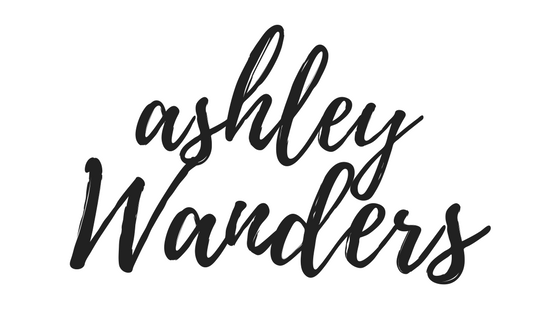 I think I would be most excited about the wildlife! Agreed! I really wanted to take a whale watching tour, but it didn’t work out 🙁 Next time! Those houses are delightful (and the scenery, of course)! 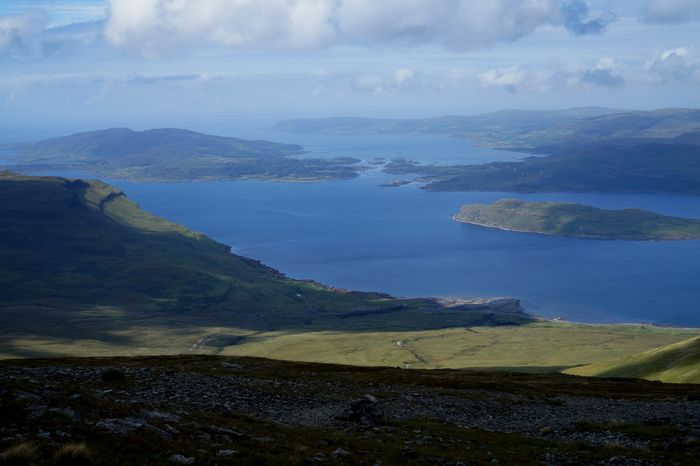 Wow, it’s beautiful there, and the vistas from the summit of Ben More are stunning! How long did it take you to hike? It is such a beautiful little island! The hike took around 5 or 6 hours, I believe! It was definitely a challenge! Your posts make me realize how little I know about Scotland! I am totally charmed by this little island, I can feel the atmosphere of the place oozing from your post. Lovely! Glad to hear that, Camille 🙂 Mull is a such special little island! It seems you are having a good time there in Scotland. I am moving to London in few days so I want to go back to Scotland soon! How exciting that you’re moving to London in a few days! I am having a great time in Scotland, and you should definitely visit again soon! I’m sorry, but I do not plan on meeting you, and I would appreciate if you would stop leaving these types of comments on my blog.